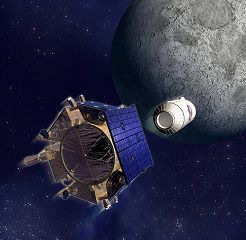 NASA's Lunar Reconnaissance Orbiter (LRO) and Lunar Crater Observation and Sensing Satellite (LCROSS) were successfully projected Moonwards yesterday atop an Atlas V rocket. 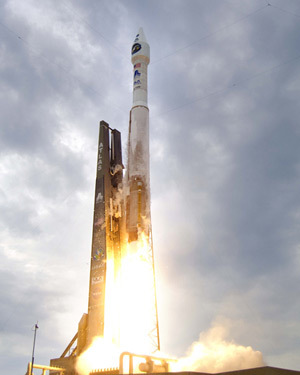 The launch from Cape Canaveral was at 21:32 GMT. The LRO separated from the upper stage at 22:16 GMT and will arrive at the Moon on Tuesday. Its mission is to spend "at least a year in a low polar orbit approximately 50 kilometers (31 miles)" above the lunar surface, deploying seven instruments to "find safe landing sites, locate potential resources, characterize the radiation environment, and test new technology". The LRO's payload includes the Cosmic Ray Telescope for the Effects of Radiation (CRaTER), designed to "characterize the lunar radiation environment, allowing scientists to determine potential impacts to astronauts and other life", the Lunar Orbiter Laser Altimeter (LOLA), which will "measure landing site slopes and lunar surface roughness and generate high resolution three-dimensional maps of the moon", and the Lunar Reconnaissance Orbiter Camera (LROC) - intended to "retrieve high-resolution, black-and-white images of the lunar surface, capturing images of the lunar poles with resolutions down to 1 meter". LCROSS, meanwhile, is still attached to the Atlas V's Centaur rocket upper stage, which it will guide in an elongated Earth orbit towards an eventual impact with the Moon's surface. On 9 October, LCROSS will release the Centaur (see graphic) on its suicide "heavy impactor" mission. NASA predicts a substantial debris plume from the crash, "expected to be visible from Earth - and space-based telescopes 10-to-12 inches and larger". Four minutes after the Centaur's demise, LCROSS will descend through the plume sniffing for possible water and other compounds of interest. For this purpose, it's packing "two near-infrared spectrometers, a visible light spectrometer, two mid-infrared cameras, two near-infrared cameras, a visible camera and a visible radiometer". NASA elaborates: "As the ejecta rises above the target crater’s rim and is exposed to sunlight, any water-ice, hydrocarbons or organics will vaporize and break down into their basic components. These components primarily will be monitored by the visible and infrared spectrometers. "The near-infrared and mid-infrared cameras will determine the total amount and distribution of water in the debris plume. The spacecraft’s visible camera will track the impact location and the behavior of the debris plume while the visible radiometer will measure the flash created by the Centaur impact." Its work done, LCROSS will also end its days in pieces on the lunar surface.